In our society, IVF is considered to be the greatest gift for families who are struggling with infertility. IVF provides families who cannot conceive on their own with a child. IVF is touted as the solution for those that struggle with infertility to have a new found hope of having a child. This is what our society proclaims about IVF yet many look at the end result without knowing the hidden facts about the process. Each IVF cycle is different and in each cycle there are a different amount of embryos made depending on the situation. These children are seen as “potential humans/persons” to I think many families who do a few unethical aspects in IVF and I think they do not see these embryos as their children but as “potential” humans. That is where I think the problems comes down to. 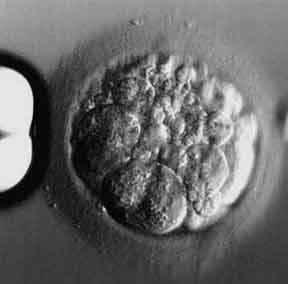 In some IVF cycles there are more babies made through the fertilizing process than born. There can be up to 15 embryos made. As an example they may take up to 10 babies through a test tube and if they “supposedly” have genetic defects, they kill them. A former IVF doctor shared that often when children have identified genetic defects early on in the test tube that often the children grow out of these defects. There is an intrinsic devaluing in life. Then the other 4 babies are killed by being flushed down a drain in the sink. Then we have 6 babies left as an example. Now these parents are told they have “options” for their “left over embryos” such as one can freeze embryos for later use or one can can donate them to science to see “what causes miscarriages” in babies or one can donate them to put them up for adoption. Freezing a child for later use can cause a mindset of viewing the child as property rather than as a person. Live Action shared about a speech that Dr. Caruso( a former IVF doctor) did for Pro-Life Action League, “Caruso states that back then they would take early embryos and implant them, but that technology and treatments kept advancing and therefore embryos would end up being frozen at later and later stages of development. “As this was happening, we were beginning to leave these embyros in culture longer and longer,” he said. “[…] we focused on the babies. […] We never really thought much beyond that.” Dr. Caruso said that the children through IVF are considered “manufactured goods.” Freezing a child for later use will just cause a child who could have a family to live in limbo and to cause you to keep paying for storage for this child that you may never allow to be born. Our personhood from fertilization is lost through IVF. If you are contemplating keeping your embryos in storage for no purpose that, is harmful as this embryo needs a family and you are responsible to care for this child as much as the child you are not paying for storage. You must see this embryo as your child and therefore not keep him or her in storage for no purpose but the cost to keep this child in storage annually is not a trade off for the gift of a priceless child being given to a family through adoption. You see I think that IVF can become a price tag on an embryo mentality and a ‘left over’ issue and not a child and parent view point. I want to give an example, imagine you have a 5 year old child and you can’t take care of them so you are given 5 options for their life. You could first allow them to perish or you can donate them to research so this child can be experimented on and have animal cells injected into them or for your child to die so that his or her cells can be injected into a person for a view of ‘healthcare’ or you can give them hope of being adopted to an adoptive family. This option is the true option as no loving parent would ever consider harm to their child so why is the child at a younger stage in life considered acceptable to put them in such harm through death or death of experimentation. The second point in options for an embryo has more detail then known. What occurs as these children are donated to science is that scientists experiment on these children. Sometimes, they take parts of their genes as they kill them and then they use the gene also from an animal and put the animals gene in the children’s genes. There is a loving ethical answer. You can donate your embryos for adoption! This is the most ethical response to act upon given the options for the embryos that you have. This life needs protection and just as your 5 year old needs your protection so does this child and if you feel personally that you cannot care for this child then allowing this child to be loved by a family who can provide those needs is the greatest gift you can give to your child! NEDC provides families with ability to donate their embryos and to have these embryos then adopted to loving families when the families choose their embryo. :) Also embryo adoption allows families to adopt children. If you are considering either please look up Dr. Anthony Caruso, a former IVF doctor, whose story is teaching society what IVF truly is.